Trump's speech to both houses of Congress was confident and combative. 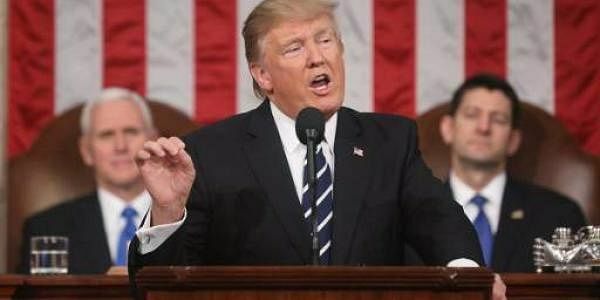 WASHINGTON: US President Donald Trump marked 40 days in office on Tuesday with a confident and combative address to both houses of Congress. Here are the key points of a speech that sought to translate his campaign talking points into an agenda for government. Trump painted his election victory as a populist "rebellion" and an "earthquake" as voters turned out to restore American pride and grandeur. He vowed to rebuild the military, end America's opiate epidemic, revive its lawless inner cities and bring "dying industries" back to life. Trump tried to dampen criticism he has been slow to respond to bigotry amid the tense national atmosphere left after a divisive campaign. He denounced a spate of threats against Jewish community centers and the vandalism of graves, as well as the apparently racist murder of an Indian migrant. Trump boasted that markets have responded to the promise of his presidency with soaring share prices, and hailed a ban on new federal government hires. He noted that he had cleared the way for oil pipelines blocked by his predecessor as a first victory for a drive to deregulate industry. Trump vowed construction would soon begin on a "great wall across our southern border" -- the physical manifestation of tougher immigration law. He said his moves to curb migration from certain Muslim countries would prevent a "beachhead of terrorism" from forming inside America, and touted a new merit-based system for approving new arrivals. The president vowed a historic corporate tax cut to boost US exports and praised his predecessor Abraham Lincoln's "protective policy." Renegotiated trade deals, pressure on businesses not to outsource labor and tax cuts will "bring back millions of jobs," he promised. rump urged Congress to back a $1 trillion infrastructure plan and adopt his "Buy American and Hire American" touchstone. And he told lawmakers to get behind efforts to repeal his predecessor's subsidized healthcare law with a plan to cut private premiums. Trump urged Americans to support the police and the victims of violent crime, two groups he said had been neglected under previous presidents. And he fingered migrants as a source of violence, introducing the wives of two officers he said had been murdered by an illegal immigrant. The US already spends as much on defense as the 14 next most powerful countries combined, but Trump vowed the largest increase in US history. And he promised to support the NATO alliance, but again warned that European member states would have to pay their own way in future.